See below a selection of Nemon’s signed hand cast portraits of Sigmund Freud. For further information about Nemon sculpting Freud, and photographs of them together, please see our ‘Nemon and Freud‘ section. These busts are also available through eBay where photos show them from multiple angles. Prices are given for UK, Europe and USA & Canada – for Rest of World please contact us for a quotation. life size sketch, the bronze original of this distinctive desk ornament is now held by the Ashmolean Museum in Oxford. Cast by hand in the UK in 85% bronze resin, and finished with an authentic verdigris wax patina, the piece is 6cm across, and 2.75 cm deep, and weighs 0.2kg. 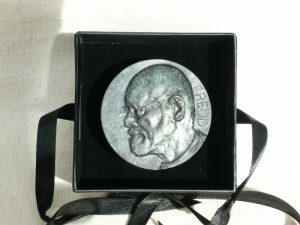 Signed by Nemon just below Freud’s chin, it is sold in an elegant velour lined black presentation box which is tied with a black silk ribbon. 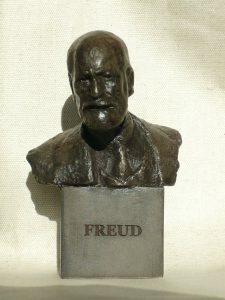 Ideal for the desk or study, where Freud of course displayed his own collection of small statues, this moving bust of Freud distills Nemon’s respect and admiration for a man he sketched repeatedly through the 1930s in Vienna and lastly in London. Hand cast in resin from an original plaster created by Oscar Nemon, this is finished with a traditional bronze resin patina. It weighs 0.35kg, and stands 11.5cm high including the base, 9cm wide, and 6.5cm deep. It is sold with a signed Certificate of Authenticity. 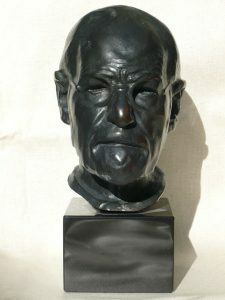 Taken from the original plaster sculpted from life by Nemon in Freud’s Vienna garden in 1931 and deemed by Freud “an astonishingly life-like impression”, this powerful and brooding signed portrait is cast by hand in 85% bronze resin, and finished with the characteristic deep wax patina of the bronze original which is held by the Nemon Estate. The bust weighs 2kg, and stands 20cm high, 10cm wide, and 10cm deep on a 7cm solid bronze resin base. It is sold with a signed Certificate of Authenticity, photograph of Nemon and Freud, and historical information. 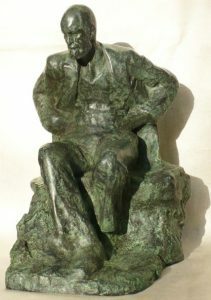 Seated Maquette of Sigmund Freud by Oscar Nemon. This bronze original of this impressive piece stands near Freud’s final home in London, outside the Tavistock Institute, and was created by Nemon though the 1930’s at a series of sittings with Freud. Cast by hand in 85% resin bronze at an artisan foundry in Britain, this signed maquette is finished with an authentic wax patina to match the Hampstead bronze. It is sold with a signed Certificate of Authenticity, and historical information about its creation. 23cm high, 17cm wide, 20cm deep. 4.1kg. 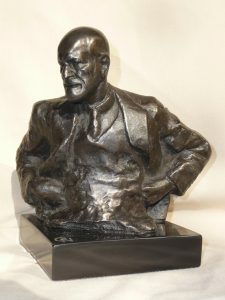 Bust of Sigmund Freud by Oscar Nemon. Created from a maquette which Nemon made to celebrate Freud’s eightieth birthday in 1936, this bust shows Freud deep in thought. Nemon had been visiting Freud in Vienna to sketch and sculpt him for five years when he created this portrait. Their friendship is evidenced by the confidence with which he portrays Freud. Hand cast in resin, and finished with an antique bronze wax patina, this stands 15 cm high, 14 cm wide and 10 cm deep. The polished resin base is signed with Nemon’s interlocking ON signature. The bust comes with a photograph of Nemon and Freud and a certificate of authenticity. 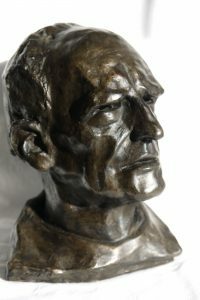 Donald Winnicott was sculpted by Oscar Nemon during the late 1960s when he would come on Saturday mornings to Nemon’s London Studio to sit for the bust now on display at the British Psychoanalytical Society and in St Mary’s Hospital Paddington. This bust is the maquette of the larger sculpture and weighs 1.6g and stands 17 cm high, 14 cm wide and 15 cm deep. It is hand cast in dark resin finished with a wax patina. It is sold with a Signed Certificate of Authenticity and Manuscript sheet explaining the circumstances in which Winnicott sat for Nemon while they were working together on the Freud sculpture for Hampstead, and two photographs of Winnicott in Nemon’s studio. Prices including tracked delivery are shown in the drop down menu. We aim to deliver all stock items within 7 days of ordering. Any longer and we’ll advise. If you need your bust urgently please let us know when you order. Please email shop@oscarnemon.org.uk if you have any queries about availability, purchases or shipping. All busts are sold to support the work of the Nemon Estate. Sculpture as Music and Silence – Ashmolean Museum Talk on Oscar Nemon 11.00 18 October. Aurelia Young launches ‘Finding Nemon’ at Pleasant Land on Boars Hill on a beautiful September afternoon. Celebrate the launch of ‘Finding Nemon’ by Aurelia Young with tea, cake and live music 15 September 2-5 at Pleasant Land on Boars Hill, Oxford. oscarnemon on Meeting my future father-in-law, Oscar Nemon. Mark p on Meeting my future father-in-law, Oscar Nemon. Please email or call if you would like to visit the Nemon Studio and Archive. The Estate of Oscar Nemon owns and defends Oscar Nemon’s copyrights, and manages the Nemon Archive and Pleasant Land Studios. In addition to the range of hand cast resin and bronze resin busts sold at the Nemon Studio and through eBay and selected retail outlets, the Nemon Estate occasionally casts strictly limited editions of Oscar Nemon’s work in bronze in conjunction with Pangolin Editions. All Nemon Estate bronze castings are dated, signed, numbered and identified to the Estate.